The 2015 Volkwagen Golf made headlines during its press event at the New York International Auto Show at the Jacob Javits Center. WorldStage was tasked by SIAM Productions and George P. Johnson with providing a 3D projection mapping system and other services for the unique reveal, which told the story of seven generations of VW Golf. 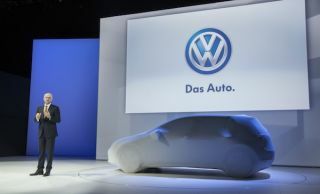 Volkswagen later leveraged the reveal online where more than 29,000 people have witnessed the event on YouTube. The stand-out presentation traced the history of the VW Golf from its launch in 1974 to the 2015 model that appeared onstage wrapped in spandex and poised on a turntable in front of a large screen. 3D projection mapping on the car, floor and rear wall showed the evolution of the car from a pencil sketch to a maquette to a production model. Then, a playful series of projections recounted the design aesthetics of the last 40 years, turning the VW Golf into a neon outline with spinning wheels, a vintage video game car, a pulse of disco colors, a puzzle of rotating Rubic’s Cube-like pieces, and a dazzling array of fractals. The screen behind the car displayed footage evocative of four decades of VW Golf and showed a timeline of vehicle design. When the presentation went dark crew removed the spandex, the lights went back up and the press got its first look at the 2015 model. Spinifex, the Australian company tasked with creating the reveal’s content, worked hard and fast to put together the stunning visuals, while the WorldStage team figured out the projection system, ultimately designing a nine-projector rig to cover the car, floor and rear wall. As it has in the past, the WorldStage team selected the D3 server system from it’s stock of media servers due to the complex mapping requirements of the project. At WorldStage TJ Donoghue and Lars Pedersen headed the projection mapping team, Raul Herrera was media server technician, Michael Alboher EIC, David Lynd audio lead, Alex Donaldson and Juan Mateo projectionists and Richard Stucker camera director.